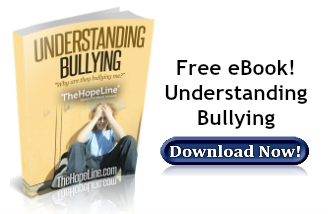 Is someone bullying you at school, work or home? You are not alone. Understand God’s hope and help for you and how to respond to the bully in these bible verses of hope. To Those Who Are Bullied…God Is for You! Isaiah 41:11-13 – All who rage against you will surely be ashamed and disgraced; those who oppose you will be as nothing and perish. Though you search for your enemies, you will not find them. Those who wage war against you will be as nothing at all. For I am the Lord your God who takes hold of your right hand and says to you, do not fear; I will help you. 2 Timothy 12:7 – For the Spirit God gave us does not make us timid, but gives us power, love and self-discipline. 1 Peter 3:9 – Do not repay evil with evil or insult with insult. On the contrary, repay evil with blessing, because to this you were called so that you may inherit a blessing. Romans 12:18-19 – If it is possible, as far as it depends on you, live at peace with everyone. Do not take revenge, my dear friends, but leave room for God’s wrath, for it is written: “It is mine to avenge; I will repay,” says the Lord. Matthew 5:43-44 – “You have heard that it was said, ‘Love your neighbor and hate your enemy.’ But I tell you, love your enemies and pray for those who persecute you. Matthew 7:12 – So in everything, do to others what you would have them do to you. 1 John 3:15 – Anyone who hates another brother or sister is really a murderer at heart. And you know that murderers don’t have eternal life within them. Ephesians 4:29-31 – Don’t use foul or abusive language. Let everything you say be good and helpful, so that your words will be an encouragement to those who hear them. Get rid of all bitterness, rage, anger, harsh words, and slander, as well as all types of evil behavior. Instead, be kind to each other, tenderhearted, forgiving one another, just as God through Christ has forgiven you.